In 2005, I was so fortunate to attend the Creating Keepsakes University in Provo, Utah and take Stacy Julian's album class. Stacy was the founder of Simple Scrapbooks magazine and a proponent of "getting it scrapped". She is a fantastic teacher and I love her "can do", "get it done" style! She makes it all seem do-able. Currently, she has a website called "Big Picture Scrapbooking" which offers all kinds of online scrapbooking classes; her "Library of Memories" class, all about organizing your photos, is one of the best classes I have ever taken! I made this album in her class, using a two-up album from Scrapworks. While these albums are no longer available, there are plenty of comparable ones on the market. We were instructed to bring over 200 photos and get them all scrapped. She did tell us to have so many of friends, family, pets, etc. so we were prepared. The album was broken down into sections called "us", "kids", "family" and "friends". She used one line of papers and matching ribbons, brads, mini-tags, and rub-ons, etc.. We decorated the section pages but then were free to go wild on the inside, using papers cut to 4"x6" and cropping our photos smaller to fit or just filling the whole 4" x 6" section with a photo. I was able to finish the album at the event, with no problem! Have you ever scrapped a 4" x 6" two-up album like this? Did you like it? I hope you've enjoyed my "Five Must-Make Mini-Album Series"! Let me know! Wow! How can I be the 1st to comment today??? I have LOVED your series this week & know that I will be able to come back to it for inspiration in the future (hopefully, the not too distant future!). I don't think I saw any Cricut images in any of your albums...is that what's missing??? How funny, because I didn't notice anything "missing" until you mentioned it...thanks for the chance to win an ATG!!! No Cricut images! You must have done all these before you had your machine :) TFS the great albums, have had fun looking all week! Love the series!!! I agree with the others I didn't see any cricut cuts. Love your series, hope you something similar again. I didn't notice any cricut cuts. no cricut, embossing, white pens scrapbooking the early years. I didn't notice any Cricut cuts, not sure if that is it, tfs you scrapbooks. Love the book. I didn't notice anything cricut. Nice albums. I don't think I saw any Cricut cuts. Just think we use to scrap with no help from any machines but boy do I love mine. Thanks for sharing. Thank you so much for sharing this mini series with us will you were away. I love what you have done and I do think I will be seeing something similar in my future. Its funny how much of the past we forget even tho we think we dont. Hope you had a great adventure and have lots to share when you get back. The mini album series have been interesting. What I noticed missing are Cricut images, embossing, a lot of embellishing. Great albums! I didn't notice any cricut images. No stamping or multi colored inks? super cute album by the way!!! TFS all of your albums this week. I've never made a 4 x 6 album like this...interesting. I noticed right away that you didn't use your cricut for any of these albums. When I look back to my very 1st albums I also have not cricut cuts in them b/c I didn't own one b/c they weren't out yet. I hope you had a wonderful time on the cruise! You are missing Cricut cuts!! thank you or showing your Album Series, i love it! It looks to me like there are no Cricut cuts! Thanks for a chance to win. I've been wanting to try that adhesive! Thank you for sharing. Great series this week. Amazing what can be done without the cricut. I have enjoyed this series very very much. No cricut or dates????? NO cricut? Can it be? Well, there is nothing "missing" the album is PERFECT. But... as the others have said as well, it was pre-Cricut. Still an awesome album to be proud of! There are NO cricut images in this album! WOW! Great Job on the album. I will be checking out the site mentioned and getting busy with my own album! thanks for all the mini album ideas. I'm already thinking ahead for Christmas gifts for my grown children. Was this done before your Cricut? No cuts that I recognize. 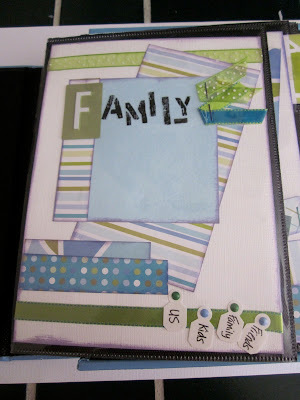 I am taking i.scrap with Stacy Julian now and I am loving it. She is one crazy busy lady. Joy, thanks so much for sharing your albums with us this week--Everyone of them is a treasure. What I noticed is that you didn't use anything Cricut in today's album. I'm thinking this album was probably done BC (Before Cricut). Am I right? Isn't it great to look back and see how far we have come with scrapbooking? I Just received a request from my daughters school to write a letter from parents for senior retreat day. What a great idea this is to add with the letter....just a few photos of particular memories from childhood....your timing is perfect! Thanks! I noticed there were embellishments, but no Cricut shapes. I really liked the album and I took some ideas from it! Thanks!! And thanks for the chance to win the tape gun! I can't figure out what was missing. The cover could have been personalized, and maybe the time period could have been included. I'm a beginner at this and I'm now curious as to what it is. I loved all of your albums! Each different and wonderful! No Cricut, no special items. Just a few flowers, simple stamps and ribbon, paper and lots of photos! It's one anyone could do, that's one of the nicest things you could show us! I've met so many ladies in the scrap section who are absolutely lost because they think they "need" lot's of stuff - and the "stuff" you showed us we need is our photos and our own writing. Loved all of the journaling you did. Telling a story of part of our life. Your grandchildren won't have to try to figure out who, what, when, where or how, because you remembered the basics of story telling! Wonderful example we too often forget! I didn't see any Cricut or Cuttlebug items! The albums came out great with what you had to use at the time! Thanks for sharing these great albums. you remind us to just put it together. What I notice is you didn't use the Cricut. So unlike you ;- ) Thanks for sharing some great inspiration. OMG there was scrapbooking before cricut!lol. Would you have included: DEARLY DEPARTED, HOBBIES and SPORTS or what happened to the PETS? I don’t like the two up album. It is too restrictive and sometimes hard to look at if you have to put a photo and text on its side. Do you make it read left to right or turn it around to read from the right. At lot of flipping around the album. I am an 8 X 8 or 12 X 12 album kinda gal! It looked like a useful workshop for beginners. They would have a manageable project all in one go and 200 SCRAPPED photos is good! Thanks for you series on mini albums. I like this one as it shows that you don't need alot of fancy stuff to scrap with. There are no cricut cuts in the albums. These must be SBC - scrappin' before Cricut, right. THEY MUST BE OLDIE BUT MOLDY! Thanks for a chance to win. All of your ablums are amazing. I love them wand will be trying some of these soon. Is it the cricut that is missing from these? Looks like it, but also some great inspiration for those that are just starting out. Thanks for the mini album week! What fun it was to check out all of your creative projects. I have started a couple of mini albums using my Your Story Photo, we'll see how it goes! Can't wait to hear about the cruise! No Cricut embellishments. But the albums are still awesome!! Cute albumn. No cricut cuts are what's missing. Love your blog! I will repeat what many said before me, no Cricut cut embellishments on any of the pages,but I still love the album and the idea of scrapping so many pictures at once. I would like to take that idea and definitely try it. I noticed that there were no Cricut images and also no emossing or extra embellishments. Boy has scrapbooking come a long way--I love my Cricut because I used to have to cut everything b hand or buy the stickers (which weren't as good as they are today). Thanks for the chance to win!. These albums must have been done before Cricut came along, that is what is missing, but they are so wonderful. I especially like the album you did for your Mom, I am going to make one for my sister, her birthday is in June, and I sent you an email telling you how much I love your layouts, they were simple, not cluttered and overdone, which makes them easier and less time consuming. Thanks Joy, you are the best. Loved your album series this week. These albums were done before the Cricut was available. Lovely work and layouts. Oops, I forgot to post my name, lol. Thanks for the wonderful website and all the tips. I don't think there were Cricut Cuts in these----but still all fabulous. I think I got more things completed a little faster in the B.C. times (before cricut), but sure do enjoy it more. I've enjoyed all of your albums this week. I've not made a small album like these before. I think you made them before cricut and cuttlebug days...so that's what would be missing, but still, lots of love in them...TFS! Really enjoyed your week of albums! and we got to see a bit about your lovely family! Hope you had a great time this week. I have to agree with the others. I liked the albums but did not see any Cricut cuts. Wonderful series on albums, thanks so much. And of course there was not a cricut image in sight. How this machine has changed the world of scrapbooking and card making. But i have to say all your albums are beautiful and you should be very proud of them. Hope you had a great time on the cruise. Thank you for an incredibly enJOYable series of posts! I love all these albums. I'm partial to the one you made your mom - we created a similar video project when my mom turned 65. Mom turned 86 this year and we had the tape digitized! It's a hoot to watch! I notice no Cricut images - how did we accomplish any crafting before the little green machine! Great job thank you for sharing your amazing creativity! I didn't see Cricut cuts, but I didn't see any dates on these either. Maybe I missed seeing the dates of when things were taken. Isn't if funny that we now consider ne Cricut images as something missing. That bug has changed how we view things. still so special. Great ideas. Didn't see any Cricut images of course! Liked your album series very much! And I LOVED the Scrabble pieces for the cover of your album! Very creative! Thanks for sharing and thanks for the giveaway opportunity! Really like the album though! I've never used the 4x6 like that, definitely will have to give it a try now! You did not use your Cricut but a cute album anyway! Only "we" would notice that anything was missing .... that little ole Cricky has really taken over our way of how we save our photos. Along with many other things we can do with him. Thanks for the chance at the ATG, wish me luck! Did not notice any cricut images, very little matting and embellies. but well done with all you need to tell the story of your family. I did one like this for my mother recently. I absolutely loved all of the ideas from the five must make mini albums! They were great! I am going to make a mini album on how my boyfriend and I met. We've been together for 5 years now.. If I start now.. by the time we get married, have children, grandchildren.. I could have one wonderful mini book. I also love the idea of.. oh who am I kidding.. I want to make one of each of the mini albums that you talked about!! I'm just so excited! They were wonderful ideas! I see NO Cricut cuts or embossing. Just pretty simple pages which is the way to get pages done quickly. TFS your albums. Loved the book and I admit : ) I had to cheat because I did not see ANYTHING missing from the pages. They were perfect as is. I thought pages for your pets were missing. You mentioned that she told you to bring pictures of those. I guess that is the good thing - that we don't always have to a cricut on every page. Thanks for sharing. Love the scrapbooks you showed us this week. Yes I made a small album once specifically about my husband's new toy, his Harley Davidson Motorcycle and he loved it. Okay, of course there are no cricut images but also some of the pages don't have the lines. Whether or not that's what you were talking about, I'm not sure. However I would LOVE to know why some of the pages aren't divided into 4x6 sections!?! Are they different pages or did you scrapbook on the outside rather than in slots? I can't wait to know!!! Thanks for all the awesome mini books you've made this week! I've really enjoyed them!!! No cricut used!!!! Wow! Your minis were really nice and I love your work!!!! I agree with the others, nothing cut with the cricut! It is amazing to think of life before my Cricut--only one year ago! LOL! Loved your series of album, I will need to try one soon. No Cricut cuts! I guess there was a world before we were bitten by the BUG!!! I loved your series this week! This inspires me to go out and tackle the mounds of pictures I have to put into albums! I noticed that you did very little embellishing...and there appeared to be no die cuts of any kind! Just journaling and titles. Very simple, yet very effective! Although I love my cricut, I sometimes just want to get something on a page without using it. Your albums show how beautiful simple scrapbooking can be! Where are the cricuts? Very gentle albums focusing on photos rather than embellies. Clear simple journaling. Mahalo for sharing. Other great book. You did a great job this week. thanks for your ideas and tips. i was thinking no cricut cuts. of course, then as i am scrolling down to post, i see other people's comments. i promise i didn't look first. haha. great series. Thanks for sharing your album. I didn't see any cricut cuts, bling or stickles. I didn't really miss it until you mentioned it. Great mini albums, thanks for all the inspiration. Hope your trip was awesome. I hope your having a great time cruisin! You left out the "Cricut cuts"!!! I dont see any Cricut cuts! What a beautiful album! It's a perfect family album..
and I didn't see a thing missing! I agree with others about the cricut cuts. Your albums look wonderful and I hope to do a 4x6 album in the future. Thanks for sharing and hope you had a wonderful time on the cruise!! I think like everyone else, cricut cuts are missing! Cricut cuts are missing--love the album !!!! Great album, but you didn't use your cricut. Thanks for sharing and the chance to win. i have LOVED your quick albums! So do-able! i have 2 little ones so it's nice to feel like i can actually complete an album! This on must be some of your earlier albums without the cricut! I haven't been scrapbooking too long but there is a major difference between my albums before/after the cricut! No cricut cuts! Funny how once we have one it takes over every thing!!! Hi Joy! I absolutely LOVE this album. I hope to come close to making such a successful album! I'd have to agree with the other respondents...there are no Cricut die cut shapes/images. Sad! I would absolutely appreciate winning an ATG system. This week's series has been great to see especially now seeing this last one with no Cricut cuts in it just shows how the trends have changed and how differently our scrapbooks look. I love this album. My bff and I have been looking at similar ones recently. They look so much quicker to scrap. Now I am definitely going to have to start and finish one!! No cricut embelishments on your album. It looks great just the way it is!